With Theepawali coming up this weekend, it’s time for some traditional snacks at home. 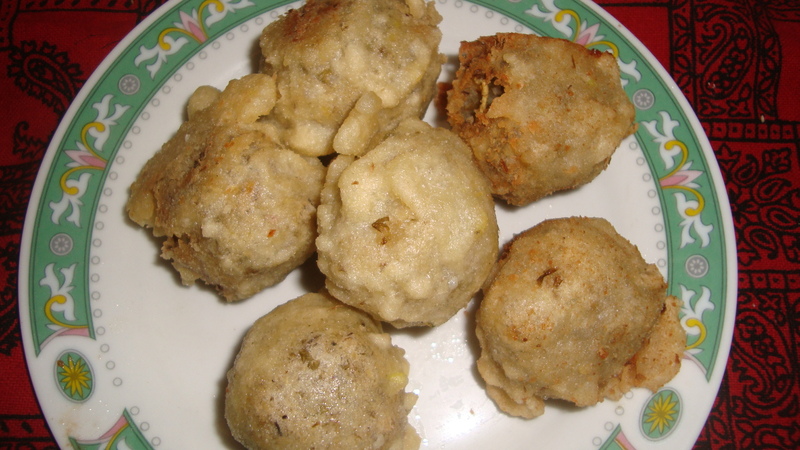 My mother made a few quintessential Jaffna festival snacks so I will be sharing their recipes here. Today’s recipe is my great grandmother’s recipe for ‘payatham paniyaram’ (a spiced green gram snack) which is a traditional Jaffna specialty made at all the festivals and celebrations in the peninsula. Plus, people tend to make this and send out to relatives in other cities or abroad as it keeps for a relatively long time. Combine the roasted green gram flour and the roasted red rice flour and keep aside. Melt ½ cup sugar in ¼ cup of water in a saucepan over low heat. When the syrup starts bubbling in a couple of mins, add the crushed cardamoms. The optional cumin, pepper and toasted coconut flakes can be added now, if required. I prefer not to have the cumin or pepper added. Quickly add in the roasted green gram and red rice flour mix into the sauce pan, continuously stirring for a few mins, until the mixture is well-combined and easy to form into balls. Remove from stove and make about 20 balls of the spiced mixture. Make the dipping batter by combining the white raw rice flour (the preferred flour) or wheat flour with a little salt and water. Coat the balls in the batter. Heat the oil for deep-frying. Fry the balls until golden-brown on all sides. Transfer the ‘payitram paniyaram’ to a tray lined with grease absorbing paper. Serve when cooled. If coconut flakes are not added, the ‘paniyaram’ can be stored for many days. With the start of Navarathri today, I thought of posting nine of my mother’s recipes of some food that she typically makes during this nine-day festival. I have always been fond of Navarathri, since my childhood, and I think of all the religious festivals that my family has observed, this has been the favourite and better observed. The nine days of the festival are dedicated to Goddesses starting with the first three days for Goddess Durga, symbolizing courage and strength, the next three days for Goddess Lakshmi, symbolizing wealth and beauty, the last three days for Goddess Saraswathi, symbolizing knowledge and wisdom. The last three days are the most special of the nine days. 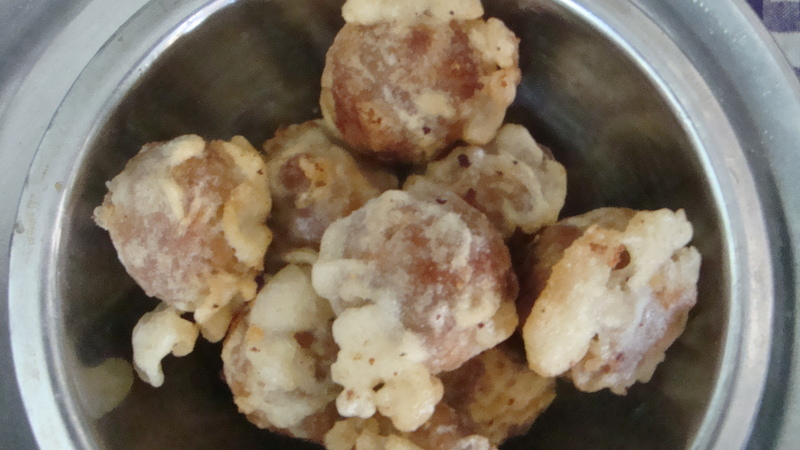 To start off the Navarathri food fest, I will first share one of my favourites – Kolukkattai. 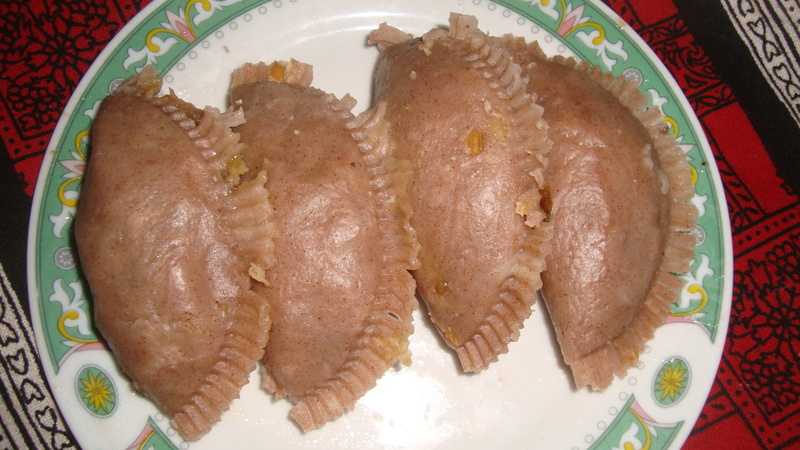 This is a steamed half-moon shaped dumpling made especially during the Aadi pirappu (July 15th, which is the first of the month of Aadi in the Tamil calendar) and during the ceremony that marks the arrival of a baby’s first teeth. 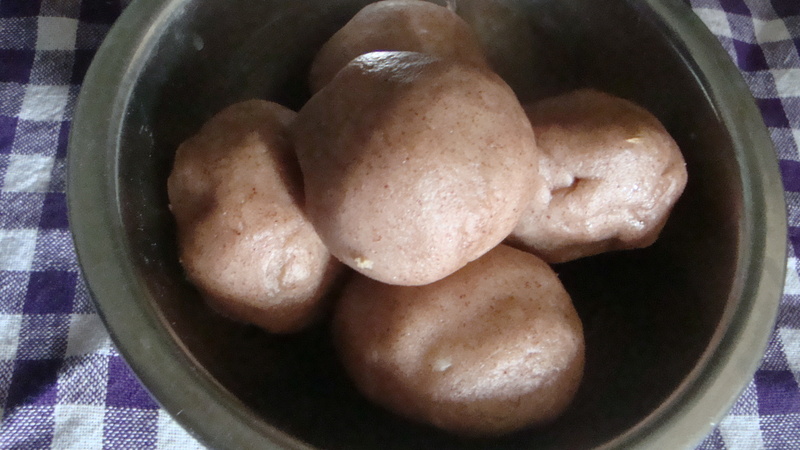 It is actually ‘Mothaham’, a round shaped version of the kolukkattai, that is made during Navarathri but at my home, my mother prefers to make kolukkattai generally. Boil the green gram in about 1 ½ cups of water, for about 20 mins, until it is well-cooked. Add water if the liquid dries up before the gram is cooked. Drain and keep aside. Meanwhile, mix the wheat flour, rice flour and a pinch of salt. Add hot water slowly while stirring the flour mix with a spoon. Add a little oil and bring together the mixture into a ball of dough. Divide the dough into 10 small balls, adding a little oil, to have a smooth dough mix. In a pan, cook the jaggery on low heat and stir as it melts. Add the scraped coconut and quickly stir for a couple of minutes, not allowing the coconut-jaggery mixture to burn. Add the boiled and drained green gram and the crushed cardamom to the coconut-jaggery mixture. Mix and remove from heat. Let the mixture cool. Roll out each of the ten small balls of dough and spoon 1 tbsp filling in the center of the rolled out dough. Close the dough wrap over the filling in a half-moon shape, by hand or using a pre-fabricated mold shell, or into a round dumpling shape. For the ceremony that marks the arrival of the baby’s first teeth, tiny coconut chips are embedded into the dents pressed by the mold or finger along one half of the half-moon shaped dumpling. Steam the ‘kolukattai’ (the half-moon shaped) or ‘mothaham’ (the round shaped dumpling) for about 10 mins. 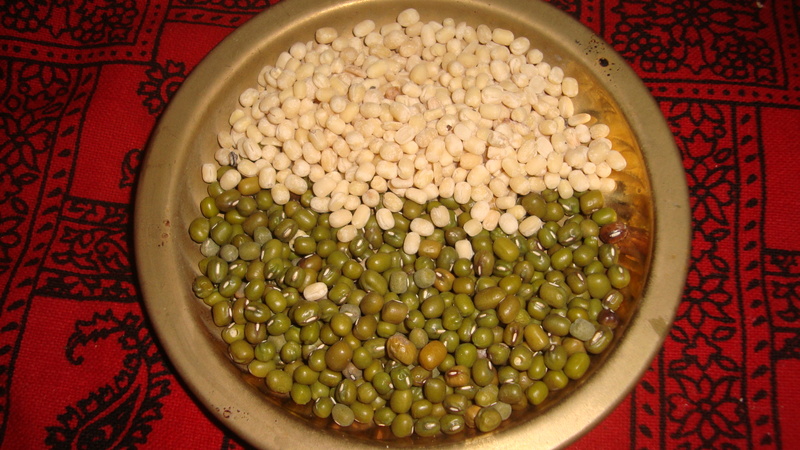 Green gram (Payaru/ Moongkatta) is used a lot in Sri Lanka as a nutritious food. It is generally cultivated in between paddy cultivation seasons. At home, my mother used to occasionally make us the ‘kadalaiparuppu soosiam’ (chickpea soosiam) more than ‘payaru soosiam’. During my undergraduate years at Peradeniya, I became fond of something that was called ‘moongkatta bole’ which was quite similar to ‘payaru soosiam’. 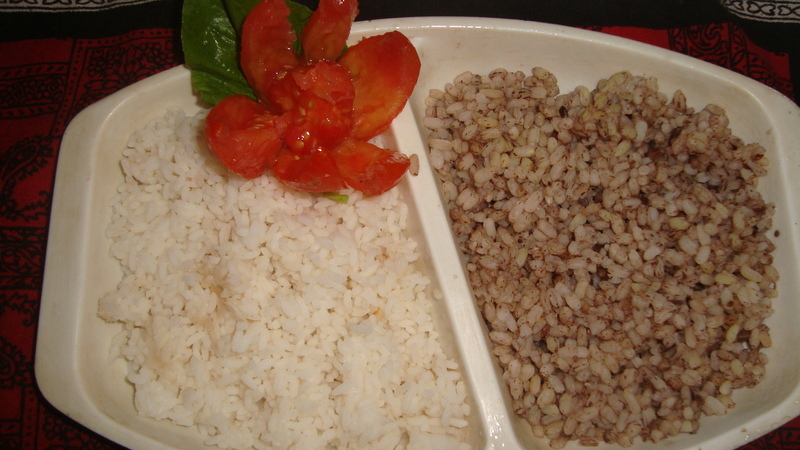 It was one of the few things that I liked from what the university canteens offered. During my visits home, I mentioned this to my mother and since then, my mother makes ‘payaru soosiam’ more often than she does the chickpea soosiam. So today, besides the ulunthu vadai recipe, I will also share my mother’s recipe for payaru soosiam/ moongkatta bole. Soak the green gram for about 3 – 4 hours. Cook the green gram with water for about 10 to 15 mins, until the gram is cooked. Drain off the water. Mix the boiled gram with scraped coconut, sugar and cardamom and grind. Make 10 balls out of the ground mixture and keep aside. Mix the wheat flour with salt. Add water little by little till a pancake batter consistency is reached. Add the vanilla extract and optional food colouring to the batter and mix well. Dip each ball in the batter, coat it thorougly and deep fry. Serve immediately with a hot cup of tea. The first day of July in the Tamil calendar is called ‘Aadi’. It roughly corresponds to July 15 on the global calendar. 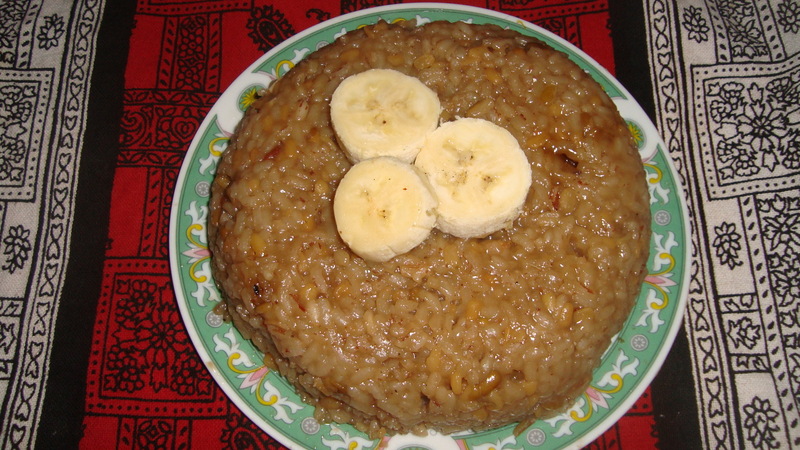 On this day called ‘Aadi pirappu’ or the birth of the month of Aadi, my mother makes a special dish usually for breakfast called the ‘Aadi Kool’. Boil the green gram, which has been previously dry roasted, in one litre of water in a pot. Midway during the boiling, add the coconut chips (not grated but little pieces chipped off from a fresh coconut). Take 2 or 3 tbsp of the roasted rice flour and add a little hot water to make a paste. Make tiny balls from this rice flour mixture and add it to the boiling pot. After a few minutes of boiling, add the rest of the cup of rice flour into the boiling pot, slowly stirring it in. When the mixture starts boiling, add the coconut milk and the grated jaggery and leave it to simmer for another 10 minutes. Take the pot off the heat and serve the Kool in little bowls.